Even though I’d eaten a perfectly good dinner right before the screening of Julie & Julia (opening August 7), I went home after the movie and ate some more. Talk about a gut reaction. The film—based on Julia Child’s book, My Life in France, and Julie Powell’s memoir, Julie & Julia: 365 Days, 524 Recipes, 1 Tiny Apartment Kitchen—is a delectable treat starring the unstoppable Meryl Streep as the famous chef and the adorable Amy Adams as the contemporary woman who attempts to make every recipe in Child’s Mastering the Art of French Cooking, Volume One in a year. The narrative moves back and forth between Child’s experiences as she learns to cook at Paris’s Le Cordon Bleu and Powell’s progress in her self-imposed project. Parallels are drawn between the women as it becomes clear they’re both trying to forge an identity for themselves, to do something meaningful in the world and perhaps even change it with their cooking. It’s no spoiler to say both succeeded in becoming published authors with a movie based on their books but the fun comes from watching how they got there. When Streep first appears on screen, looking like a giant (Child was 6’2″; apple boxes must have been used because Streep’s feet are rarely seen) and speaking in that voice, there was a round of hearty laughter in the audience. You will laugh, too; there’s no point resisting. But as the movie unfolds and Streep’s magic takes over, you’ll get used to the voice because the actress has fully embodied the chef and that’s just how Child talked. In lesser hands, the performance could’ve easily devolved into caricature but Streep somehow makes every big gesture believable and endearingly quirky. Her gift of complete transformation into every role is remarkable and she will undoubtedly receive Best Actress nominations from all the major outfits come award season. Adams does her usual sparkly work as Powell, making her an accessible Everywoman who’s a little sweeter than the author comes across in her book, where her language is saltier. Meanwhile, I don’t get the appeal of Chris Messina, who is as bland playing Powell’s husband, Eric, as he was in Made of Honor and Vicky Christina Barcelona. As Child’s husband, Paul, Stanley Tucci fares better, generating sweet, sensual chemistry with Streep. This is especially noteworthy considering the last time they appeared together onscreen, he played a gay underling cowering from Streep’s nightmare boss in The Devil Wears Prada. Jane Lynch is so winning as Child’s sister, Dorothy, I wish she had more screen time. And Mary Kay Place pulls off several moments of hilarity as Powell’s mom though she’s only heard on the phone and never seen. Director/screenwriter Nora Ephron did an impressive job keeping the pace zippy, the dialogue tart, seasoning each scene perfectly and never letting it overcook. Alexandre Desplat (The Queen, The Curious Case of Benjamin Button) turns in another memorable score, and cinematographer Stephen Goldblatt (Charlie Wilson’s War, Angels in America) made me want to book a trip to Paris immediately with the way he captured the City of Light, as golden as the perfect dishes Julie & Julia pull out of their ovens. Stephen Goldblatt could put a paper bag over Paris and I’d still want to go there. 🙂 Thanks for the review, PCN! Look out, it’s gigantic Streep! LOL! No surprise Ms. Streep is wonderful in this movie, isn’t she always? Never read the book, but knew I would go as soon as I heard who was playing Julia. Almost every Streep movie is a masterpiece, at least regarding her acting. So it wouldn’t surprise me if she broke her Oscar-nom record. She’s become one of the best actresses of all time -and is quickly becoming the very best. And Amy Adams’s not only a sweetheart but she’s stepping up her game, and it has shown in lots of her films: she was hilarious and lovely in Enchanted, amazing in Junebug and sooooo believable and compelling in Doubt so it isn’t strange at all to read that she delivered again. She’s becoming a real pro indeed. Meryl Streep is my all-time favorite actress and Amy Adams has certainly found a place in my heart as well since her debut in ‘Enchanted.’ Caught the previews of ‘Julie and Julia’ couple weeks ago and was delighted at what I saw! Popcorn always fills me up during a movie but have no doubt, like Elyse, will be hungry coming out! LOL! Maybe even get more serious about cooking. That’d be a nice change. I’m looking forward to this next week. My wife may even attend with me since the Julia’s cookbooks crowd her book case (we’ll see…). Thanks, PCN, for the review. Finally got to see this last night (with she-who-must-be-obeyed in tow). We both really enjoyed it. 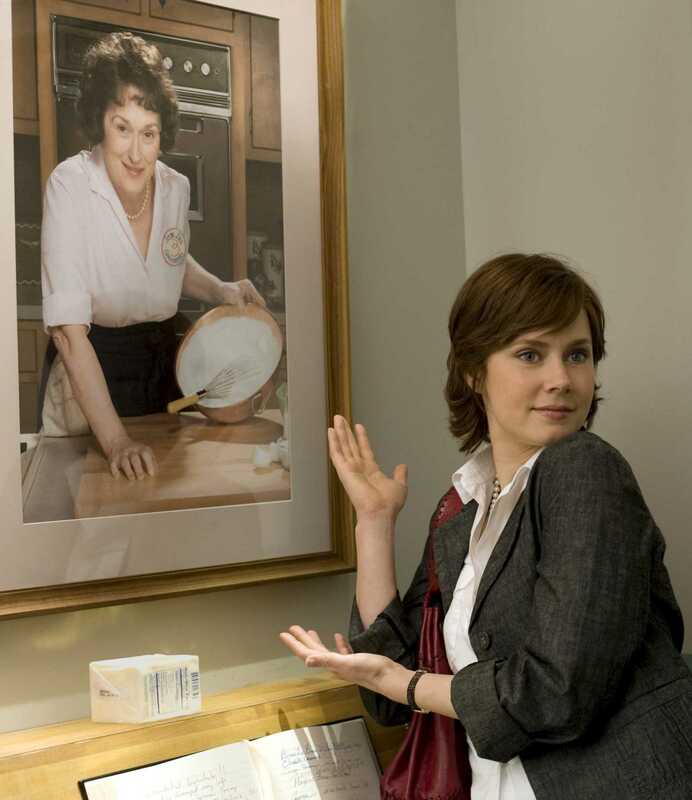 But, my wife found some character insertions frustrating as she wished more of them (like Jane Lynch as Julia’s sister). I agree with you re: Messina–perhaps it was how it was written, but he’s overmatched with others on screen. But to me, it’s Streep and Tucci’s movie. They own it every time when they’re on scene. And my two favorite lines come from each of these characters. Decorum prevents me from repeating them, but it’s Julia’s descriptive manicotti line, and Tucci’s calm and unexpected delivery of a two-word summary for a publisher’s shortsightedness. Great stuff all around. Thanks, PCN. Glad you and your hot date liked it! It’s definitely Streep and Tucci’s movie. It’s not Amy Adams’s fault (I love her); the Julia and Paul scenes were better written and just more fun to watch. The older couple had more joie de vivre than Julie and her bland husband. I remember Paul’s two-word comment about the publishers but you’ll have to remind me via e-mail about the other funny line. I only remember laughing. And there should be a sequel about Julia and Dorothy so we can have more Jane Lynch! Okay, it sounds better when spoken out loud with an accent…. I will be there in line the day before it opens….in a tent….with an espresso machine hooked up outside…okay, I’m finished. Sorry, I haven’t been around. Adam losing the crown on AI, just devastated me….but I’m bb-a-a-a—-ck! BTW: is it me or does Meryl Streep look HUGE in that one shot by herself? Guess they made everything in the room much smaller, huh? Wow…not only did this review make me totally wanna see the movie even more than I already did, but it also made me totally HUNGRY! And you hardly mentioned food at all…must just be the thought of them cooking. Either way, glad you dug the movie…I was worried it might be a little cheesy but your review has set me straight! Can’t wait to see that one! I so worship Meryl Streep!! The movie will come out here on September 16th. I guess Paris context will help it hit the box-office! Hi…I totally agree with your take on the actors’ performances in this move…..they were all well done. I, however, did not care for the movie at all…..all though it had some substance……there was a heavy dose of blandness in the story. Scene after scene of typing and cooking, fretting and cooking, typing and cooking, fretting and cooking left me bored and anxious. Although I do admire, the gusto both real life women possessed, there wasn’t much of a “story” to merit two hours. Sorry to hear that, Bailey. Did you find anything amusing at all?